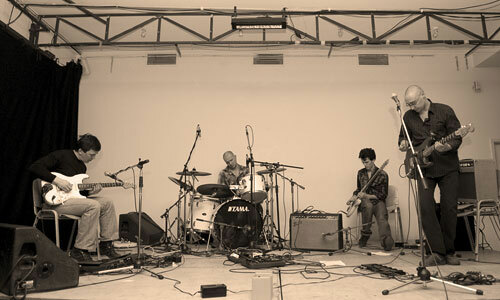 DISEN GAGE branched out in 1999 when guitarist Konstantin Mochalov, guitarist Yuri Alaverdyan, and bassist Nikolai Syrtsev were studying at Moscow Engineering Physics Institute. Joined by Eugeny Kudryashov on drums, the quartet started playing out in their native college-club and became known with a surprising quickness due to fantastically fast spread amateur cassettes and their reputation for insanely emotional live performances at various student-festivals. The band's collaborative approach combined the intricate instrumentation of old-school progressive rock, the melodic expressionism of ethno-jazz, and the rough drive of garage-rock. Music-lovers apprehended the band as a phenomenon in local indie-scene, one of a few heirs in Russia to the traditions of instrumental rock. In addition to their work with the band, Mochalov, Alaverdyan and Syrtsev continued working as researchers at the Moscow Institute of Bio-Organic Chemistry, and Kudryashov played with a number of local indie-pop-rock groups. In 2002, tearing apart between their musical and academic interests the band practically stopped concert activity. Two years later, Yuri Alaverdyan left to continue his academic career in Sweden. Nevertheless, the quartet got over the difficulties with the appearance of the crafted guitarist Sergei Bagin, and returned to the active concert practice. Free streaming or immediate digital download of the album (in your choice of MP3-320, FLAC, or just about any other format you could possibly desire) is available through Official R.A.I.G. Bandcamp. "Russian prog quartet Disen Gage is now back with their third strike '…The Reverse May Be True', locating themselves this time between the structural constraints of their first CD and the improvisational freedom of their second CD, and veer off orthogonally into multiple different dimensions. The band is listing classical composers (Debussy, Ravel), progressive musicians (John Wetton), comical sci fi authors (Douglas Adams) and film directors (Georgi Daneliya) among their influences, which should give their prospective audience a relative idea of what to expect. If that doesn’t help, the wildly surreal cover artwork (great digipak design!) and the insane song titles should underline that Disen Gage rarely try to woo their listener with common sounds. The short opener 'What’s Up On Planet Plyuk? ', a clear reference to the Soviet era science fiction cult movie 'Kin-dza-dza! ', retains a clear soundtrack kind of atmosphere and would equally have fit for the dark works of Caro and Jeunet. This is followed by the longer 'Landing', displaying the quartet’s progressive side, combining elements of Frippish guitar antics with Zappaesque anarchic wit. Expect fusion jazz elements, Eastern European folk patterns and occasional quasi-vocals that fuel the gonzo atmosphere, and you have the main ingredients of Disen Gage’s sonic universe. The whole album clings to a humorous science fiction concept. The musicians are tight enough to pull everyone of their ideas through without ever struggling with own limitations, and although at times you might hear keyboards, horns and tubas, you should know that all these sounds have been created by guitars. 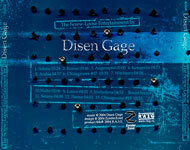 Disen Gage have made a huge step forward since their rather untransparent previous album, and whenever they run in best form, as on the first two and last two tracks on the CD, they deserve nothing less than the maximum rating. The middle of the record can’t always compete with the more compelling aforementioned material, but in the end, '…The Reverse May Be True' is Disen Gage’s finest moment so far! Progressive rock fans with a sense of humour have no excuse not to listen to this album, especially since the band put it for free downloading on their homepage! (Grade: 9/10)" – by Pascal Thiel at DisAgreement (Luxembourg) (February 2009). "If you're looking for a musical universe where classical influences coexist with elements of progressive rock and the avant-garde all on the same album then you'll definitely want to check the third full length release from one of Russia's most respected and original sounding bands Disen Gage... The Reverse May Be True is further proof of this units consistent artistic brilliance at crafting both adventurous and thought provoking compositions. (Score: 4,5/5)" – by Ryan Sparks at Sea Of Tranquility (USA) (March 2009). "At times the group can become, if I can coin an oxymoron, aggressively bucolic and sometimes teeter on the edge of falling over the edge. However, they maintain control and know just when a piece has to be reined in or even ended. This increased control is an indication of a greater confidence and musical maturity, although one has to consider that maybe the confidence has gone too far by including the aforementioned off vocalisations. The Reverse May Be True is probably the most accomplished of the three albums released by Disen Gage thus far... If intelligent, quirky and off-beat instrumental prog hits the right buttons with you, then this album is definitely one to check out before it disappears. (Conclusion: 7.5 out of 10)" – by Mark Hughes at DPRP (UK) (April 2009). "Lesson number one on how to mix prog rock, fusion jazz, russian folklore and science fiction soundtrack scores and a little bit of easy listening in a wild mixture of avantguarde rock music... It is soundtrack music to a movie not even David Lynch dares to shoot, because it is at the same time pompously boisterous and inflated as well as crazy freaked out outer space weirdness... Disen Gage is actually the bar band playing at the restaurant at the end of the universe every night for the lucky crowd able to get a seat with full frontal view of the apocalypse. And when they hit full 'mamushka' mode the party is bound to get really wild. And when you wake up the next morning, with a memory of the world having turned upside down you might remember a faint echo of what the title of this album really means." – by Georg Gartlgruber at Monochrom-Cracked (Austria) (September 2009). The album was also reviewed at: ProgArchives (USA), Inoi Lip (Russia), Sonic Frontiers (USA), Rate Your Music (USA), Progwereld (The Netherlands), Progressive Area (France), Progressive Ears (USA), ProgArchives' interview with Disen Gage (USA), New Underground Music (The Netherlands), Babyblauen Seiten (Germany). "Since their debut album, the instrumental guitar-driven prog group Disen Gage has taken a left-field turn in a more improvisational direction. The new album is decidedly less concise, more exploratory and, undeniably, more experimental. 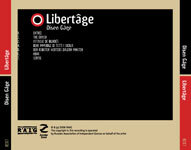 If the first album had a fair amount of King Crimson like passages, then the same could be said of Libertage, although the comparison could be taken one step further to include improvised live albums such as THRaKaTTaK and even some of the ProjeKCt off-shoots. The album does require concentrated listening. It would probably be useless and annoying as background music but when properly listened to, preferably in darkness with headphones, the music has the ability to transport the listener. Okay, instrumental prog is not everyone's cup of tea, and when the music is improvised and in places bordering on the avant-garde, then the audience is likely to be even smaller. 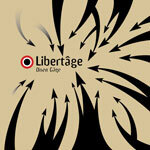 But if experimental, truly progressive instrumental music is your cup of tea then Libertage could be just what the doctor ordered. (Conclusion: 7 out of 10)" – by Mark Hughes at DPRP (UK) (March 2007). "Wow... this cool all instrumental Russian band are back... I quite liked the last one but I think this one is even better! I really like the way that the band use this push and pull like technique to interact between the instruments. I also like the way they mix in some strange sounds and extra atmosphere to the music. Quite a unique group... The CD begins with the slowly building 'Entree'. Very melodic and it sounds like synthesizers some of it but it is Guitar and the mood then changes to something more mysterious and dark. I really like the improvised aspect of the CD as it seems composed in some way, the band is always taking interesting twists and turns in the music. 'The Crash' begins with some intense drumming and bass playing as the two guitar players play against each other in some way before the track breaks out gets quite psychedelic and very jazzy in some way. 'Attaque de Blindes' is next and begins quite strange before the track builds on some cool bass playing and back and forth between the guitars and then the drums kick in and the guitars go back and forth with cool playing. 'Bebe immobile di tutti I Sicilia' is slow to start and then really gets quite interesting with some guitar that sounds like a woodwind instrument. 'Der Roboter' is where the CD really takes off. This and the next 14 minute track, 'H5N1' are just killer stuff. The music is intense and the playing awesome. The CD ends with 'Sorte' and this is quite a moody piece but features really cool guitar playing. A really great and adventurous and challenging CD. (5 out of 5)" – by Scott Heller at LowCut Magazine (Denmark) (#42, April 2007). The album was also reviewed at: Neformat-Boom (Russia), ProgArchives (USA), DisAgreement (Luxembourg), InRock (Russia), Nota-Bena (Russia), Salon Audio-Video (Russia), Muz-Prosvet (Ukraine), Hishiryo (Japan), Gagliarchives (USA), Aquarius Records (USA): Customer Favorites 2006, ProgressiveEars (USA), The Silent Ballet (USA), iO Pages (The Netherlands), Babyblauen Seiten (Germany). "Opener 'Solaris' sets the tone starting with ethereal keyboard tones leading into an almost psychedelic groove akin to Ozric Tentacles in their prime. With the next track, 'Komar', we get to the crux of the band, the interplay between the dual guitars, one providing the rhythm and the other incessant sound effects that bring to mind King Crimson. This comparison continues with 'Augenapfel' which features some nice soloing. The bass is prominent throughout and takes a more up front role in the percussion-laden 'Katergeriin' which features a more ethnic beat and a return of the spacey keyboards. A few power chords and some rather strange spoken passages add to the interest. 'Arabia' does, as one would expect from the name, have a more Eastern feel and takes the band into more of a fusion direction, like something from an early Al Di Meola album. Memories of early Twelfth Night are brought to the fore in 'Chinagroove #17' while 'Witchtanz' is rather more discordant and although along similar lines to what had gone before is perhaps rather too fragmentary to work completely. Credit to the band though for trying to throw in something a bit different. 'Latino' is really more of the same kind of thing. Not meant as a criticism, just that I've run out of comparisons! There is a greater use of sound effects in this piece and more of the oddly spoken voice. Things are jazzed up a bit on 'Jewboilove' where a different sound is heard courtesy of the saxophone of guest musician. The sax blends in surprisingly well in the mix and this is one track that I feel fades out too fast, particularly as there are some good bass and drum parts. Final studio track, 'Waltz' comes closest to displaying the group's ethnic traditions as there are definite elements of Russian folk songs (or what I, as a Westerner, have been led to believe are Russian folk songs!). A short jolly number that rounds things off nicely. The three bonus cuts, recorded live in 2002, prove that the band can accurately reproduce their material on stage. 'Solaris', the only track from the studio album, is a very true replica of the original and the quality of the performance and recording is first rate. Indeed, on first hearing the album I didn't even realise it was live! 'Theme' lowers the tempo and has a more slow jazz feel to it while 'Chinagroove #15' is a near relation to the '#17' that appears on the album. Many people shy away from all instrumental albums for some reason, particularly when a lot of classic progressive rock has great swathes of instrumental music contained within the characteristic long-form pieces. That is a shame as there are many great instrumental albums out there. The Screw-Loose Entertainment will probably never reach the status of a classic but Disen Gage have come up with an interesting and worthwhile album. Lovers of guitar music with a twist a la the Crimsos should seriously consider checking the album out before all 1000 copies are sold out. (Conclusion: 7 out of 10)" – by Mark Hughes at DPRP (UK) (July 2004). "...You can't expect anything but highly intelligent rock music from these guys, and the opener Solaris from their debut album The Screw-Loose Entertainment makes me wonder. I always thought King Crimson only released three albums during their Eighties period, but this could be instrumental outtakes from a never published KC album. But to be fair, Disen Gage don't limit themselves to be inspired by Fripp's guitar sound and polyrhythmic complexity, they also are strongly rooted in fusion jazz, with especially the bass guitar creating an earthy sound, and the drums don't shy away from complicated percussive moments. 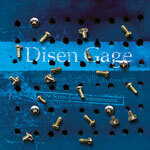 Unlike many instrumental bands, Disen Gage don't need ten minutes to play a song. In fact their pieces are all very compact and yet full of detail and beauty. Anything longer would probably ask too much attention of the listener. The regular part of the album contains ten songs that run for forty nervous minutes, full of highlights like the deliriously playful 'Augenapfel' and the jazzy 'Jewboilove'. Let's face it. A band that call itself after a song from Robert Fripp's best solo effort Exposure has to sound like King Crimson, but Disen Gage are smart enough only to borrow elements of KC's rich sound and add their own textures to create their very own masterpiece. This is much better than guitar hero albums. This is playful music with emphasis on two duelling guitars that always let the song win over in the end. Absolutely recommended for fans of smart instrumental progressive music. (Grade: 9/10)" – by Pascal Thiel at DisAgreement (Luxembourg) (May 2006). The album was also reviewed at: InRock (Russia), Groove (Sweden), Delusions Of Adequacy (USA), Splendid (USA), Aural Innovations (USA), ArtRock.PL (Poland), Chaos Vault (Poland), Music In Belgium (Belgium), Rate Your Music (USA), Nota-Bena (Russia), Impakte (Maroc), ProgArchives (USA), Free Albums Galore (USA), Babyblauen Seiten (Germany).